The section of preventing age-related conditions cannot be complete without an article on how to prevent heart attacks. I was just watching a program on the television called the Angina Monologues which aims to increase awareness of the fact that women die of heart attacks as well as men. In the first five minutes I learned that one in three of both sexes are likely to die from a heart attack. I had no idea that the figure was so high. But I do know that heart attacks are a leading killer in both sexes once women have passed the menopause. Although the number of attacks is greater in men when they are younger, the protection which women have until the menopause decreases after this event and women are then as likely as men to have an attack. In part because women have heart attacks at older ages than men do, women are more likely to die from an attack within a few weeks, according to the Genetec Heart Attack Fact Sheet. There is much you can do to prevent heart attacks and improve your heart health in the long term. Stop smoking - this might be one of the most important decisions of your life if you want to live to a ripe old age. Smoking can raise your risk of CHD and heart attack. Ask your doctor for advice and go to the pages on age-well.org on how you can quit smoking. Also try to avoid breathing in second-hand smoke through passive smoking. If you suffer from high blood pressure read the advice on age-well.org on how to control this condition. If your blood cholesterol is too high read the advice on age-well.org about how to bring this to healthy levels. Read our advice on Healthy Eating for Healthy Aging, but specifically read our pages about lowering your blood pressure with the DASH diet. All of these resources provide general information about healthy eating. Controlling your weight wil also lower your risk of CHD and help prevent heart attacks and strokes. If you are obese or even only slightly overweight, especially if this extra weight is around your middle, ask your doctor to suggest a weight-loss program that includes diet and physical activity or visit our pages about Controlling Your Weight. For more information about physical activity, go to our page Exercise well. If we are going to be able to prevent heart attacks in both sexes, it is necessary, first of all to know what causes them. Oxygen from the air we breath is taken to the heart muscle and other organs of the body through our circulatory system. When the flow of blood is obstructed, for whatever reason, we are having a heart attack and if the flow does is not restored rapidly, part of the heart muscle will start to die. 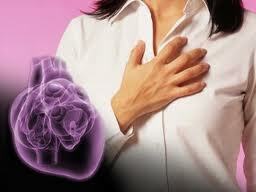 Most heart attacks occur in people suffering from coronary artery or coronary heart disease (CHD). This condition occurs as a result of the build-up of plaque within the coronary arteries which restricts the flow of blood to the brain, the heart and other organs. When plaque builds up in the arteries, the condition is called arterioslerosis or atherosclerosis or hardening of the arteries which occurs over many years. Eventually, part of this plaque can rupture inside the artery, causing a blood clot to develop and if this increases in size it can partially or completely block the flow of blood to the heart muscle. If the blockage is not treated rapidly enough, the area of heart muscle which is irrigated by the artery begins to die as scar tissue replaces the healthy tissue and may lead to long-term complications. 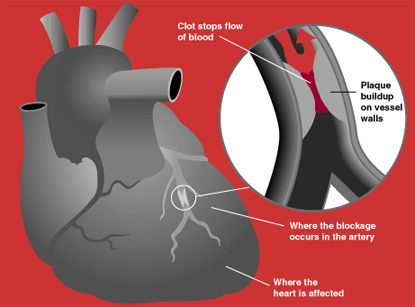 Severe spasm of the coronary artery is another cause of heart attacks. These spasms might also be caused by atherosclerosis, but it is not the only cause. A pain in the left or center of the chest or discomfort in the chest area, including uncomfortable pressure, or a sensation fullness. This feeling of discomfort may gradually increase and eventually become painful. This discomfort or pain often fluctuates or lasts for several minutes. Upper body discomfort which may show itself in one or both arms, the back, neck, jaw, or upper part of the stomach. Nausea, vomiting, feeling light-headed or dizzy, or breaking out in a cold sweat. Symptoms also may include sleep problems, fatigue and lack of energy. Each year, about 7.1 million people die each year due to coronary heart disease and CHD, which often results in heart attacks, is the leading killer of both sexes in the United States. Therefore, If you think that you or someone else is having a heart attack, call for an ambulance immediately as rapid intervention is absolutely necessary. Do not attempt to drive yourself to the hospital if you think that you are having a heart attack, call an ambulance so the paramedics can work on you if your condition deteriorates and to avoid causing a road accident.